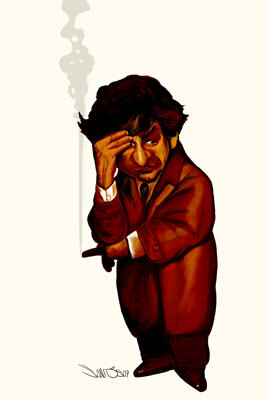 Caricature of Peter Falk as Lieutenant Columbo. Columbo is an American crime fiction TV series starring Peter Falk as Lieutenant Columbo, a homicide detective with the Los Angeles Police Department. The show popularized the inverted detective story format; each episode began by showing the commission of the crime and the perpetrator. The character first appeared in an 1960 episode of the anthology series The Chevy Mystery Show (later to be adapted into a stage play). A pilot movie was broadcast in 1968; the series aired regularly from 1971 to 1978, and later, sporadically from 1989 to 2003, when the last episode was broadcast. The character of Columbo was created by Richard Levinson and William Link, who claimed that Columbo was partially inspired by the Crime and Punishment character, Porfiry Petrovich, as well as G. K. Chesterton's humble clerical detective Father Brown. Other sources claim Columbo's character is based on Inspector Fichet from the classic French suspense-thriller Les Diaboliques (1955). Columbo is a shabby, apparently slow-witted police detective; although, as criminals eventually learn, appearances can be deceiving. Columbo uses his deferential and absent-minded persona to lull criminal suspects into a false sense of security; meanwhile, he solves his cases by paying close attention to tiny inconsistencies in a suspect's story and by hounding the suspect until he or she confesses. Columbo's signature technique is to exit the scene of an interview, invariably stopping in the doorway or returning a moment later to ask "just one more thing" of a suspect. The "one more thing" always brings to light the key inconsistency. Columbo's wardrobe was provided by Peter Falk himself. They were his own clothes. Peter Falk would often ad-lib "Columbo-isms" (fumbling through pockets for a piece of evidence and discovering a grocery list, asking to borrow a pencil, becoming distracted by something irrelevant in the room at a dramatic point in a conversation with a suspect, et cetera) into his performance as a way to keep his fellow actors off-balance. He felt it helped to make their characters' confused/impatient reactions to Columbo's antics more genuine. Steven Spielberg and Jonathan Demme each directed episodes of the show during its first run. Jonathan Latimer and Steven Bochco were once writers. Ben Gazzara directed episodes "Troubled Waters" (1975) and "A Friend in Deed" (1974). Peter Falk himself directed the last episode of the 1st season, "Blueprint For Murder". Nicholas Colasanto, who acted in Raging Bull and Cheers (as Coach), directed some episodes, including "Swan Song" with Johnny Cash. However, "Étude in Black", which is credited to Colasanto, was actually co-directed by its co-stars John Cassavetes and Peter Falk as a favor to their friend Colasanto. This has given rise to the false rumor that Cassavetes sometimes directed under the pseudonym Nicholas Colasanto. Patrick McGoohan directed five episodes (including three of the four in which he played the murderer) and wrote and produced two (including one of these). Vincent McEveety was a frequent director, and homage was paid to him by a humorous mention of a character with his surname in the episode "Undercover" (which he directed). The whole Columbo collection can be found on Amazon here. Some pictures taken in Madrid Spain. Madrid is the capital and largest city of Spain. Residents are called Madrileños (madrilenians). The city is located on the river Manzanares in the center of the country, between the autonomous communities of Castile and León and Castile-La Mancha. Due to its economic output, standard of living, and market size, Madrid is considered the major financial center of the Iberian Peninsula; it hosts the head offices of the vast majority of the major Spanish companies, as well as the headquarters of three of the world's 100 largest companies (Telefónica, Repsol-YPF, Endesa). As the capital city of Spain, seat of government, and residence of the Spanish monarch, Madrid is also the political center of Spain. The current mayor is Alberto Ruiz-Gallardón, of the conservative Partido Popular. The population of the city was 3.2 million (December 2005), while the estimated urban area population was 5.1 million. The entire population of the Madrid metropolitan area (urban area and suburbs) is calculated to be 5.84 million. The city spans a total of 607km² (234 sq mi). As the capital of Spain, Madrid is a city of great cultural and political importance. While Madrid possesses a modern infrastructure, it has preserved the look and feel of many of its historic neighborhoods and streets. Its landmarks include the huge Royal Palace of Madrid; the Teatro Real (Royal theatre) with its restored 1850 Opera House; the Buen Retiro park, founded in 1631; the imposing 19th-century National Library building (founded in 1712) containing some of Spain's historical archives; an archaeological museum of international reputation; and three superb art museums: Prado Museum, which hosts one of the finest art collections in the world, the Museo Nacional Centro de Arte Reina Sofía, a museum of modern art, and the Thyssen-Bornemisza Museum, housed in the renovated Villahermosa Palace. This was just so fun, what a day! above the Communications Palace, Current Office of the Mayor in Cibeles Square. Plaza Mayor, aplace where some artists get together, great atmosphre in this place that has sufered 3 fires. in these pictures you can see Vizcarra´s work being plagiarized by every caricature artist in the Plaza. Some pictures taken from Tours France and its Cathedral. Tours is a city in France, the préfecture (capital city) of the Indre-et-Loire département, on the lower reaches of the river Loire, between Orléans and the Atlantic coast. Touraine, the region around Tours, is known for its wines, the perfection of its local spoken French, and for the famous Battle of Tours in 732. It is also the site of the cycling race Paris-Tours. Tours is the largest city in the Centre region of France, although it is not the regional capital, which resides in its second-largest city of Orléans. In 2006, the city itself had 142,000 inhabitants and the metropolitan area had 297,631. The cathedral of Tours, dedicated to Saint Gatien, its canonized first bishop, was begun about 1170 to replace the just-started cathedral that was burnt out in 1166, during the quarrel between Louis VII of France and Henry II of England. The lowermost stages of the west towers (illustration, right) belong to the 12th century, but the rest of the west end is in the profusely detailed Flamboyant Gothic of the 15th century, completed just as the Renaissance was affecting less traditional patrons than bishops, in the pleasure châteaux of Touraine. These towers were being constructed at the same time as, for example, Château de Chenonceau. Some great paintings relay inside this monument. And they are really big! Inside the triple-naved church, building proceeded as always from the sanctuary and choir, which has some of the finest stained glass (13th century), and worked pier by pier down the nave. The choir is 13th century; the transept and east bays of the nave are 14th century; a cloister on the north is contemporary with the facade. The atmosphere of the Gothic cathedral close permeates Honoré de Balzac's dark short novel of jealousy and provincial intrigues, Le Curé de Tours (The Curate of Tours) and his medieval story Maitre Cornelius opens within the cathedral itself. This painting impressed me the colours are so vivid and seem so fresh to the eye. You can notice the chest of Jesus seems to flow away from the rest of the painting. Well, this is the rest of a stay in France, next headed to Madrid Spain.